Yesterday we went on a beautiful overnight trip to a lake here in Switzerland. As soon as we got there my two year old daughter was saying, ”I want be carried,” ”I want food,” ”I want a drink.” There seemed to be no end to her ‘wants,’, and they all seemed to come in a rush. How could she be hungry, I thought, we’d just had a big lunch. And as soon as she’d claimed she was hungry, she was onto the next want, her need for food seemingly forgotten. ”I want to go home” she demanded, which was impossible, as home was three train rides away, and it seemed a shame not to enjoy the beautiful sunny day. Recently when we’ve been out and about she’s been asking to go home a lot. It started when we tried out a new playgroup, and although the experience was exciting for her. it seemed to leave her feeling overstimulated, and needing down time. I wondered if it was a feeling of disconnection that was causing this barrage of ‘wants,’ and that what she really needed was to process some of her emotions. ”I want to ride” my daughter said pointing at a carousel we passed by the lake side. 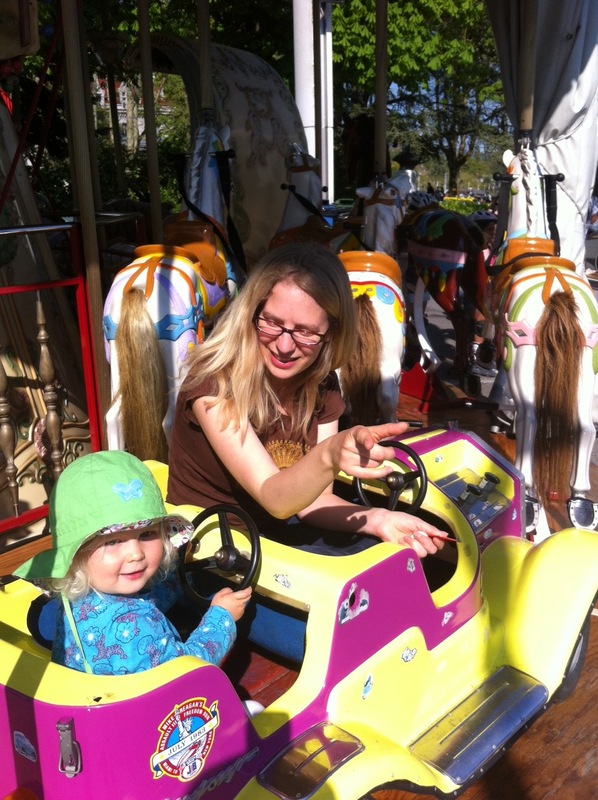 I thought about it for a moment, remembering how much she loved the carousel at the autumn fair in Basel, and how she’d spent weeks in imaginative play afterwards at home, making rides for her dolls and teddys. I also knew that sometimes when we want to help our children with their feelings, especially at times of disconnection, that it’s good to say yes for a while. So I bought some tokens for the ride, and we had a great time together. After the first go she didn’t want to come off, and I knew that a tantrum was coming. But the ride was quite short, and I didn’t want to interrupt her fun so quickly so I let her stay on for another two rides. Then I realised that it was actually quite expensive, and it was really time to stop! As I told her it was time to go, she was clinging tightly to the car she was sitting in. She started crying. I didn’t want to seem like I was angry, and dragging her away, and usually I would wait till she felt better before we moved, but I did need to prise her hands away in a hurry, as we had to jump off before the carousel started going again. She was crying, as I went to sit on a wall by the lake. She kept crying, as I gently explained why we had left. I gave her time to finish crying, to get all of her upset out. I knew that although she loved the ride and wanted to stay on, it was about more than that. She’s often very flexible, and can understand and accept when we need to go, or when we can’t do something. But this time it was also about the upset feelings she’d been carrying with her all week, that were making her feel like she desperately ‘wanted,’ and ‘needed’ something, when in actual fact what she really needed was some warmth and connection to release her feelings. After crying, her kind of desperate ‘I want’ attitude had completely disappeared. We spent a lovely time, paddling in a pool by the lakeside. So if you find your patience being tried by constant demands, perhaps see if your child actually needs a bit of extra connection. Special time, or doing something our child loves together is a great way to rebuild our connection with our children when they’re upset, or have experienced a separation from us. And what often happens is that afterwards our children may start to cry. Patty Wipfler refers to this as the ‘spoiled outing’ phenomenon, that amidst all the love and connection, and togetherness our children might have a meltdown. It may seem like our children are ungrateful or greedy or just spoiling everything by letting their feelings spill out over a day that was meant to be fun. But we can look at in a different way, that they’re soaking up our love and attention, and they feel safe to tell us how they’re feeling. They may not tell us in words. They may tell us by crying when we say no to an ice cream or tell them it’s time to go home. But I hope you’ll remember the message of this blog, that crying is a healing process, that our children shed upsets, and stress from the not so special times through tears. If we can wait till the end of the tears, without distracting or interrupting our children, but instead giving them lots of closeness, and connection, then we may find that the day, far from being spoiled, is even brighter than before. Previous PostStaylistening With An Infant – A guest post by Brooke MarchNext PostGetting Ready for Company: How tears made the difference!